The Islands of Divine Music is a novel of five generations of an Italian-American family finding its place in the New World. Against a backdrop of Immigration, Prohibition, the Cuban Missile Crisis, the Vietnam War, and the new millennium, five generations of the Verbicaro family make their way from Southern Italy to San Francisco as each character brushes up against some aspect of the divine. The family matriarch is Rosari, a little girl whose family flees Italy because her prodigality is exploited by illiterate kidnappers. After her beautiful, psychotic mother’s suicide, the girl and her despondent father come to San Francisco, where she meets the man she’ll marry, a handsome, fiercely strong peasant named Giuseppe Verbicaro. 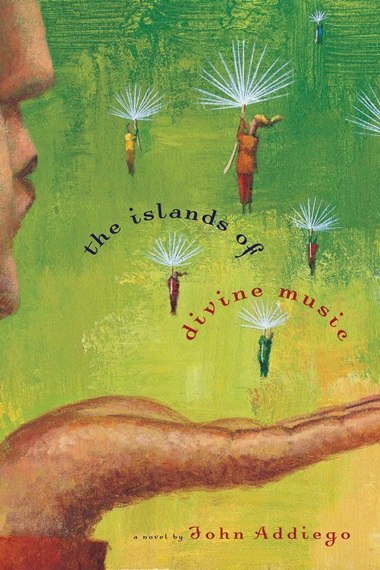 The twelve linked stories of The Islands of Divine Music are portraits of family members whose lives are interwoven in one narrative that spans 100 years. Rosari and Giuseppe’s oldest son, Narciso, a handsome and dim-witted dandy, barely evades death and the stain of organized crime by his simple-minded innocence and luck, while his passionate brother Ludovico, a talented third baseman in the old San Francisco minor leagues, falls prey to the illicit dreams of a wise guy from the Gambino family. His scheme to smuggle Cuban cigars to the San Francisco Bay nearly ends in drowning but leads to a kind of salvation. Their youngest brother, Joe, a brilliant child and shrewd businessman, is ashamed of his ethnicity and, in particular, his father. This is due in part to the fact that Giuseppe, wandering North Beach, believes that God directs him to marry a teen-aged, pregnant Mexican prostitute named Maria. Further senility, faith, or vermouth convinces the old man that Maria’s child, Jesus, is the product of an immaculate conception. The event is both a family disgrace and a bizarre blessing. The child’s life and tragic death come to have a profound effect on Giuseppe’s progeny, particularly Joe’s children: Penelope, who flees the country following involvement in deadly anti-Vietnam War activities, and her brothers Paulie and Angelo, who are inspired by the young Jesus to embark upon a quest of several thousand miles to recover the family’s lost and most prized spiritual treasures. At that moment Janine wrapped a wool scarf around her pained neck and stepped from the coach onto the soil of Calabria. It didn’t look at all like the crumpled map she held, or feel like the fantasy she had fostered. The station was dull, drained of color, and it stank of raw sewage. The first impression didn’t portend well. Janine was intuitive, random-abstract, and she relied on portents. She was artistically gifted but a little wobbly with directions and helpless with foreign languages. She wasn’t very good at math, either, and converting dollars to Italian lira and figuring out how to get to the ancestral village from a station where nobody seemed to understand English was daunting. Nevertheless, and in spite of her father’s advice about hiring a driver, she decided to rent a motor scooter for some indecipherable amount of money, from a man with eyes like her Uncle Ludovico’s, and drive to the little hill town. She stuffed her map into the rucksack against a long baguette, her dictionaries, her sketch pad, and her men’s shaving bag filled with prescription drugs and naturopathic remedies. She pulled the mannish roadster cap down to her eyebrows and throttled the scooter. A cluster of men gave her advice and directions about operating the Vespa. So far the men of the South weren’t the pigs of Rome, but they all seemed to regard her with an expression somewhere between predation and disbelief. Who was this weird, rich American woman in a man’s pants and hat? In her midtwenties, and yet she was childless, unmarried? Perhaps they could see the Italian in her face and guess that she was here to see family. Perhaps they could see something in her eyes which revealed how weird she really was. The city had cobbled streets with chuckholes and piles of pig dung, and she maneuvered among these obstacles without turning her head because of the spinal meningitis. She made blind turns, once nearly crashing into a Volkswagen truck heaped with vegetables, and headed out of town. At the first fork in the highway she took the wrong turn. An hour later she came around a bend and saw a town built on and into cliff walls. Janine was so startled she killed the motor and got off. Muddy brown brick and mortar were slapped over the precipice, making it difficult in places to distinguish between the work of man and the work of God. Shuttered windows seemed to open out of the earth. Clotheslines stretched across chasms, from stunted pine to rusted balcony. She took out her sketch pad, her loaf of bread, and some cheese she’d bought en route. Janine had a fine hand and a facile talent with visual arts, and her work attracted the interest of a couple of women trudging up the road who rested from their labor of balancing firewood on their heads to peer over her shoulder. She guessed they were mother and daughter, the latter a beautiful woman in her twenties with a long, delicate nose and bushy eyebrows which accentuated a mischievous look. What did that look mean? She couldn’t understand a word they said. She gestured, they spoke, she shook her head and shrugged, they laughed. The young woman leaned over her, the loose sleeveless dress billowing in a warm gust of wind, and Janine inhaled the aroma of the girl’s bush of armpit hair. Taking the scarf off her head, the woman shook her black hair out and posed coquettishly. Janine drew her face quickly, as she had done the faces of children and old men in Rome the previous day. She smiled at her own work before handing it over. She helped carry the firewood to their home in the cliff village, piling much of it across the saddle of the Vespa and standing on the running board. This evoked a lot of stares from the men in the piazza. The older woman and two men of her age took her by the elbows and led her to a dinner table for a feast which lasted almost three hours. It appeared that a dozen neighbors or relatives followed and joined in as they ate, including an old matriarch who took the seat of honor at one end, and all the while the family of eight or a dozen laughed and spoke while Janine and the young woman, whose name was Marie, exchanged furtive glances across the table. The mother held up the drawing of her daughter, and the audience oohed and ahed. Although Janine understood almost none of the language, the expressions and gestures of the people at table were so familiar that she felt she’d already heard this entire conversation and understood it perfectly, sitting among her aunts and uncles in her grandmother’s house many nights near the San Francisco Bay.